In middle school, Carter and I used to check out a book called “Amazing Animals of Australia” from the school library and renew the hell out of it. 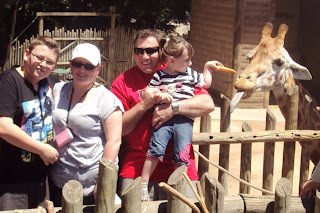 Carter’s family was all about exploring the stranger corners of the animal kingom—over the years their pets included a boa constrictor, a chinchilla, a Savannah monitor, a corn snake, and countless garter snakes caught at the park. And that’s just the tip of the iceberg. 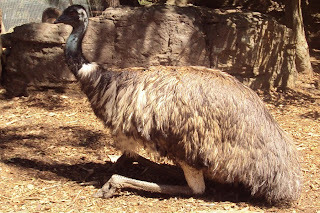 In any case, the animals in that book were so foreign and fascinating, and it’s only fitting that our first sunny day in Sydney was spent at the zoo. I looked up Mexican food on Google Maps this morning, which led us to an underground food court between George and Pitt Streets. We had a late start, and it seemed inappropriate to eat so early in the day, but a burrito is difficult to pass up. We took one for the road. Yesterday was rainy and today was hot and sunny. 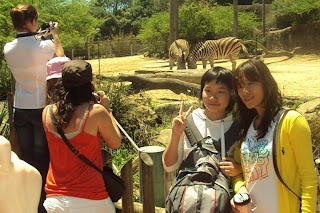 The cost of the ferry, which at $48 seemed steep, included admission to the zoo. Whatev. We went for it. As it turned out, zoo admission is $41, so really the ferry was only $7 roundtrip. Also, the line to buy admission at the zoo was insanely long, and we got to skip it. Also, once we were in, the line for hot dogs and sausages was at least a half hour wait. But we brought a burrito! Score! Once things settled down, the zoo was a great time. I’ve seen a fair amount of zoos in the past couple years—San Francisco, Oakland, San Diego, Auckland, and New York (Central Park)—and Sydney’s stands with the best of them. One thing that stands out is its sprawling size. It’s huge. 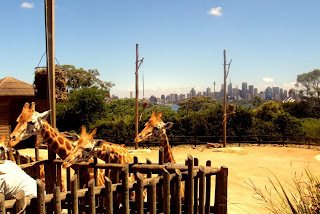 And Sydney Gal was correct: the zoo provides stunning views of the Sydney skyline. Located on the north side of Sydney Harbour, it’s perfectly angled toward the Opera House and the Harbour Bridge. And then, of course, there are all the fascinating animals: kangaroos, wallabies, koalas, echidnas, tapirs, and 11 of the 15 most deadly snakes in the world. In the building that houses the nocturnal animals, they turn the lights on at night, and then keep them off during the day, so the animals are all on opposite schedules and thus come out when visitors are around. Tomorrow, we’re going to the beach. Maybe. The zoo is quite proud of the new baby elephant on the far left. 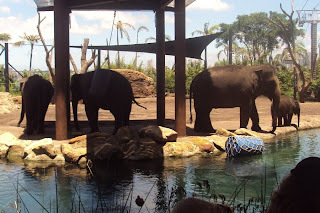 He's the first African elephant born in Australia. Zebras were very popular today. Zoo employees are pretty good at staging photos like this where the giraffe looks to be stealing the carrot with its tongue. Still funny. 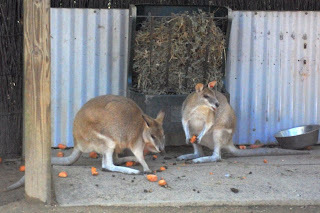 Most of the kangaroos were lazing in the sun, but these guys were hoarding the carrots. Near the end of the day, Luisa and I sat down to look at a map. 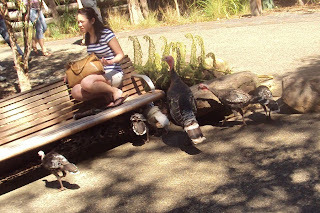 I looked over and saw a flock of turkeys (far more than are pictured here) inexplicably flocking toward us. All I could say was "Uhhh... Turkeys!" And suddenly they were everywhere. I had to scramble to get this picture, leaving Luisa to fend for herself. 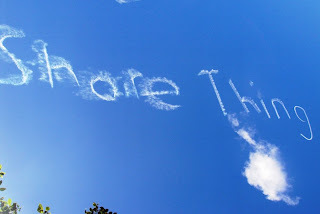 Twice today, an airplane wrote across the sky, "Bondi NYE Shore Thing" to advertise the New Year's Eve celebration at Bondi Beach. The first time the letters stared, I slowly pretended to read, "Su rr en der... Do ro thy." 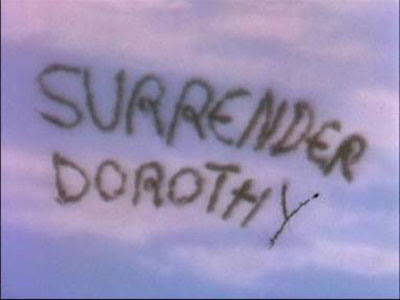 Then I looked around and asked, "Who's Dorothy?" But no one, not even Luisa, thought it was funny. Fine then. I would have laughed at the Dorothy comment. Did you get to hug a koala? That's what Jen wants to do. Great Giraffe pix. I wonder what the crowds will be like in the winter. "What is happening?!" - who am I? Looks like FUN! Mom & I would have laughed also, in fact I laughed when I read it... so now you have 3 fans! I still remember when you would collect pennies to go to Australia, even though you all say I made that up... I'm glad your dream is being realized - even if it was my dream for you. Good day mate.